The Maine Wildlife Park, located on Route 26 in Gray, will open for the 2015 season on Friday, April 17th at 9:30am - just in time for school vacation the following week! Even though visitors will not need their snowshoes, there will be a few remaining snow banks as the park grounds are still melting! The brand new Canada lynx exhibit is sure to be a favorite with visitors this year. Our 2 lynx kittens have grown substantially over the winter, and use their climbing logs, trees, boulders and exhibit space to the fullest extent. A formal dedication of the exhibit, funded in large part by the Friends of the Maine Wildlife Park, will take place at 11:00am Friday, May 1. The most popular animals in the park have to be the moose. The park currently has 4 moose in residence, our oldest bull is going on 11 years of age, a younger bull is 2 this year and just dropped his antlers; the 2 cows are ages 6 and a yearling. Our audio tour has been enhanced as a dynamic park touring tool with the launch of a new mobile web app! Using their smart phones and mobile devices, visitors will now have more information available than ever before about Maine's native wildlife. Visitors can access the tour by scanning QR codes in the park, or through the park's website, to find out so much more about our many wildlife species! This tool is also a great resource to learn more about the park and its wildlife from the classroom or from home. A variety of new weekend events are planned for the summer, beginning Saturday, May 2nd with the 'Wild Cats of Maine'. The following week, build a birdhouse to take home, and further on through the season you can enjoy a winter ecology program, practice archery, learn about and see live snakes and turtles, meet Donn Fendler from 'Lost on a Mountain in Maine'; or Bob Crowley from the popular TV show 'Survivor'. The Center for Wildlife, Atlantic Salmon and Honeybees will also be featured as weekend events. Favorites like the Open House/Farmers Market, Pow Wow, Chainsaw Artists, Northwoods Law Day, Rick Charette and Halloweenfest will all be back as well. Plan to purchase your Family Season Pass now so you don't miss any of the fun; and be sure to pick up an Event Calendar! Keep up with current photos, stories and events on Facebook too. Many families cannot wait to visit their favorite animals after the long winter, but close to 20,000 followers have 'kept in touch' with our wildlife via Facebook over the winter, 'liking' and commenting on photos posted of our wildlife as they adapted to winter snow and cold. But everyone's ready to see the moose, bears, lynx, cougar, eagles, owls, foxes and more again in person! The Maine Wildlife Park has over 30 species of native wildlife on display, plus wildlife gardens, nature trails, a fish hatchery and other interactive exhibits and displays. The park is open daily from April 17th through November 11th from 9:30am-4:30pm; visitors must leave the premises by 6:00pm. Admission to the park is free for ages 3 and under; $5.50 ages 4-12; $7.50 for adults, and $5.50 for seniors. Groups of 15 or more are $3.50 per person. Bring a picnic and spend the day! Family and Community Season Passes are available, and are an incredible bargain for families and groups that visit the park several times over the course of the summer. Remember that Family Passes make a great gift; and are available for purchase in the Department of Fish & Wildlife's Online store @ www.mefishwildlife.com. 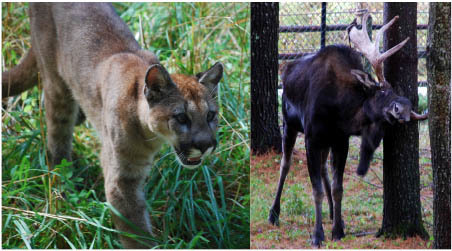 207-657-4977; or visit us online at www.mainewildlifepark.com , www.mefishwildlife.com or on Facebook! GEMS OF ROUTE 26: Rich in culture, ecology and history, the Maine Wildlife Park, Shaker Village, Poland Spring Inn and Resort, Poland Spring Preservation Society, Poland Spring Preservation Park, and the grounds of McLaughlin Garden truly are "The Gems of 26."